From Medicom. 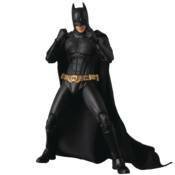 Medicom adds Batman from Batman Begins to their MAFEX lineup! He's about 6' tall, and highly posable for maximum action! An extra interchangeable Bruce Wayne head is included, as well as an extra chest piece to use with it. Batman's cape is removable, he comes with interchangeable hands, and he also has a grapnel gun and batarang, and a base with a posable arm.